Common Size: 32" x 32"
36" x 27" 58" x 33"
Corkboard surface designed to hold (6) 8-1/2" x 11" sheets of paper. Semi-gloss black finish blends in perfectly to any outdoor or indoor environment. 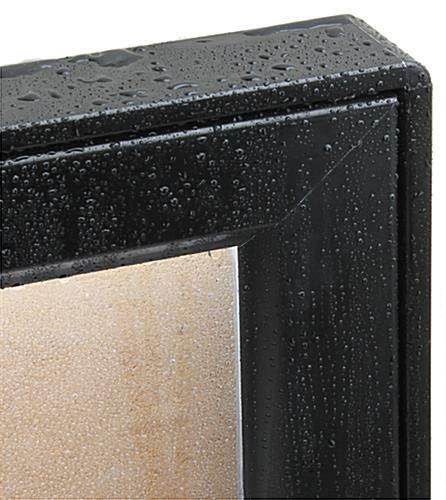 Rubber gasket seal out rain for a weather-proof enclosed corkboard. 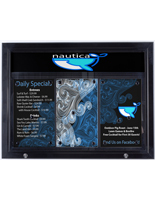 LED lighting along the top of frame illuminates menus and postings [lighting along top of swing-open frame only]. Polycarbonate door with lockable cabinet keeps important posting safe, secure and intact. Power supply with 73" long cord produces a direct current of 12 volts, resulting in 30 watts of power for the LED lighting. 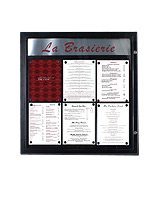 This swinging menu case is an effective way to get your message out to the public. Each unit has a large interior surface which enables users to put-up many postings. 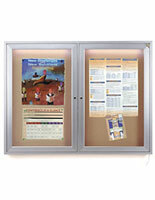 This swinging menu case, also known as enclosed bulletin board, can holds up to 6 sheets of 8-1/2" x 11" prints. Messages can be easily attached on the easy-to-tack corkboard, by using push pins, thumb tacks or staples. Each corkboard lights-up drawing attention to the content and making it easier to read by customers. 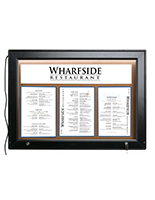 An illuminated swinging menu case has a built-in concealed light located on one side on the unit. The corkboard uses energy-saving, LED bulbs to light up and therefore businesses can keep the unit on all day without spending much on electricity. 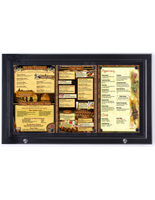 This enclosed bulletin board, swinging menu case that illuminated features a swing open door which permits easy and convenient access to the content in the case. During the change out process, users can use the two rods on either side to support the door and keep it open for workers to easily display their printed messages. This illuminated restaurant case, swinging menu case that is weather proof can be used indoor or outdoor. 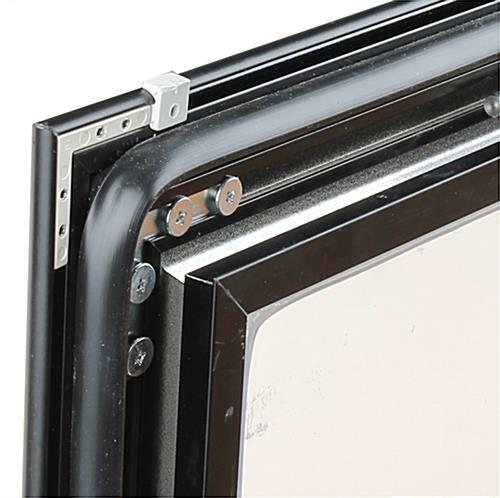 Each unit is built with rubber gasket on the inside of the frame to keep moisture out, so as not to damage postings. 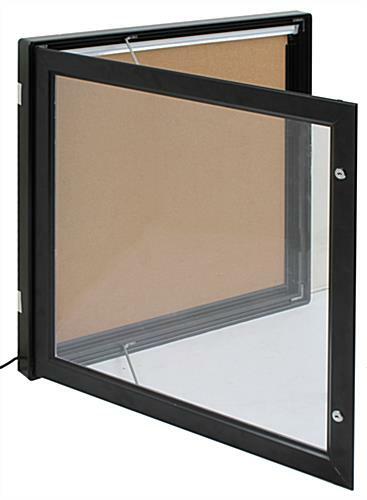 Therefore, this enclosed swinging menu case can be used indoors or outside. 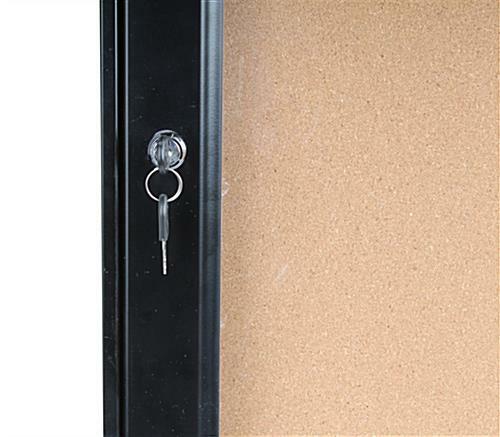 This corkboard also features two locks on the side to secure the unit to prevent unauthorized access, especially when used in public areas. 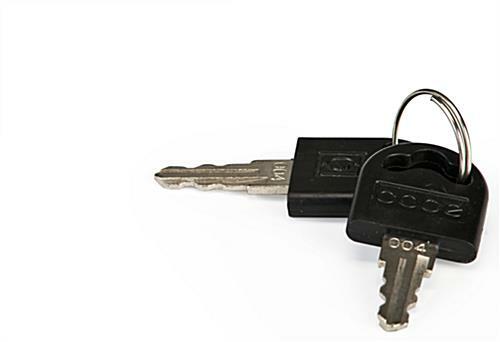 A set of two keys is provided with this swinging menu case that locks. 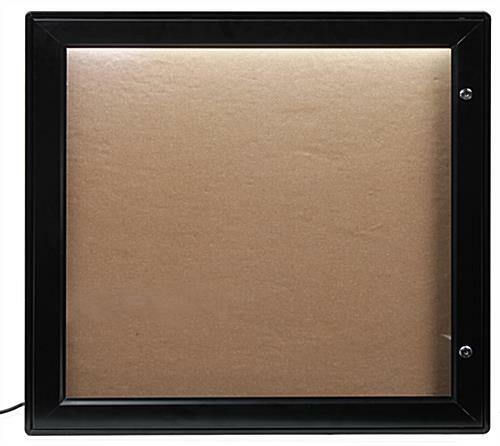 An illuminated corkboard, like the one seen here, is constructed from anodized aluminum with a black finish. The neutral design of this exterior-rated corkboard makes the unit ideal for use in any business. The purchase of this unit comes with a 73" long power cord with grounded plug. Most real world applications utilize a professional electrician hard-wiring the unit directly into the wall power source (thus excluding the power cord application). 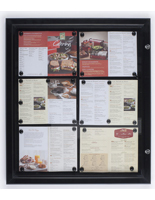 These restaurant boards are often found used outside a restaurant or bar for advertising new menus. 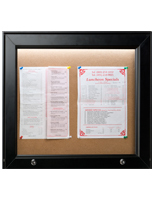 The wall-mount corkboard can also be used to show schedule or special events in churches or schools. Keep everyone's up-to-date about what is going on with this enclosed bulletin board! 31.5" x 31.5" x 2.0"